This page has been a long time in the making! Truly a perfect example that you don't have to finish a journal page in one sitting. I started this page on May 1st and while I put the finishing touches on it a couple of days ago, my journey of discovery is still going strong. On April 30th, I caught a quick glimpse of flowering trees tucked in along the tree line on the cart path of our neighborhood's golf course. It was almost dark and I decided it'd be best to make a clear ID the next day, which happened to be May Day! Perfect for celebrating, the day was adorned with a Carolina blue sky, plenty of sunshine and the heat and humidity were trying to creep in but a soft breeze kept it comfortable, especially in the shade. The challenge was to time our trek to the fourth hole so we didn't interfere with golfers... Finally, in the early afternoon there was a lull in play. I had my camera and sketching supplies ready to go and couldn't get there fast enough! upper canopy trees. It was glorious! I'd never seen so many Sparkleberry trees grouped together. Some were shrub like, others dainty trees. I didn't want to leave, but since the golf course was still being used, we had to move on. I knew of another Sparkleberry tree that I could sketch and off we went. Here is the plein air sketch. 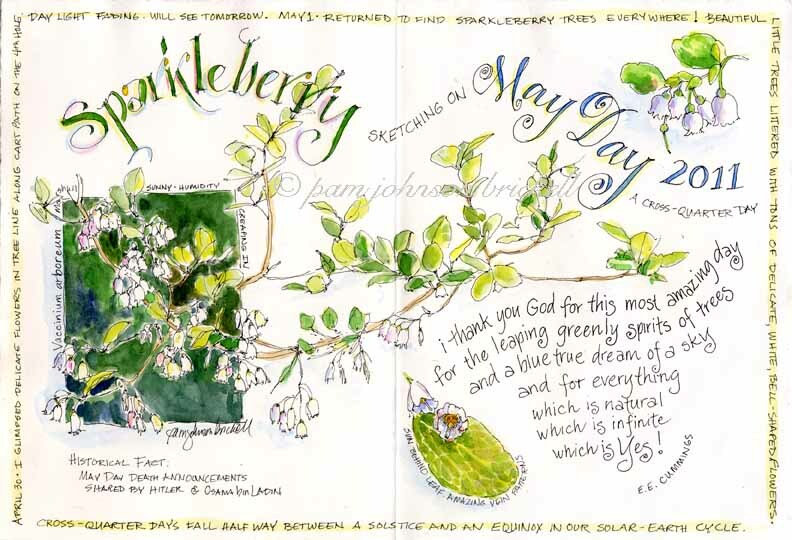 I wanted to celebrate May Day and the Sparkleberry Tree together. Something was driving me to take my time in planning how I wanted to finish this spread. A tissue paper overlay is a great way to experiment with the placement of other elements you may want to add to your page. It keeps the paper from being compromised from too much erasing. I started research on May Day and here's where my journey of discovery began. The traditions of dancing around the Maypole and the making of May Baskets are familiar to me, but when digging deeper in my research, I found out that May Day is a Cross-Quarter Day. Ancient mankind was very attuned to solar, earth and lunar cycles. The Vernal and Autumnal Equinoxes and Summer and Winter Solstices were major days for marking of length of daylight versus darkness, distance between the earth and sun and for celebrations to honor the four seasons. Then, after a time, days that fell halfway between Equinoxes and Solstices were used to mark additional seasonal/agricultural changes. Enter... Cross-Quarter Days! Many religious holidays can trace their roots to these early agricultural origins! In fact, today, our yearly calendar notes three out of the four Cross-'Quarter' Days. Are you ready? I've noted ancient names in parentheses. Ground Hog Day (Candlemas/Imbolic), May Day (Beltane) and Halloween (Samhain/All Saints Day)! The only C-QD that, for the most part, gets ignored by modern man is August 1st (Lammas/Lughnasa). There are some regions that celebrate this time of harvest but mostly we, in the 21st century, haven't a clue it exists. I also want to note that February 2nd, May 1st, August 1st and October 31st are rather generic versions of the exact timing of a Cross-Quarter Day. Some of the information I pulled up on the internet got quite involved. One source spoke of C-Q days as 'movable feasts,' another referred to them as a 'window of time' and yet another related these special days to the phases of the moon. I can go on and on but I really must finish this post! Somewhere in my research I learned that May Day was associated with honoring trees. This made me smile as I wanted to celebrate the Sparkleberry! Wow, all this information and I have a journal spread that measures 7.5 x 11 inches! I really needed time to think this all through. Then, that evening, it was announced that Osama bin Ladin was dead. Mercy, that horrible feeling from 9-11 came rolling through me. I saw Americans celebrating his demise while I could feel only sorrow for our fallen and our country. Too little, too late, now what lies ahead? A few days later I heard that both Hitler and bin Ladin share May Day as the time their deaths were announced to the world. Too weird for me. On a happier note, in July, a poem by E. E. Cummings that perfectly describes my feelings as I sketched the Sparkleberry, found it's way to me by chance. Ah, all my journal page pieces are in place... I can finish my page. This is BEAUTIFUL Pam. I remember our Sparkleberry renderings pre-Christmas, so this bodes well for the coming winter projects. Also, the ee cummings poem is spot on. Wonderful description of your process! Thank you, Deb! 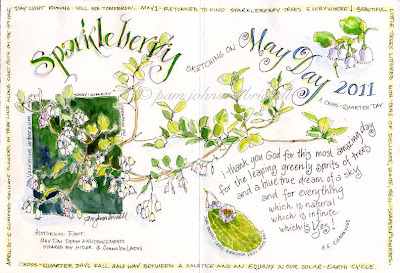 Sparkleberry - a wonderful subject to render and letter :) Here's to more days of both! Beautifully created and so wonderful to hear about the cross-quarter days....methinks I'll be doing some research as well! What an excellent post and beautiful page! I have never heard of sparkleberry trees - but now I know! And I know so much more about cross quarter days and May 1st. Thanks so much for sharing all this information as well as your planning for your journal page and your beautiful outcome! Thank you, Laure! This research opened up a whole new way to living in harmony with our earth. I think you'll enjoy your research! Thanks, Rhonda! The highest Sparkleberry's get in a small swath into mid Kentucky and then some in the lower, eastern third of Missouri and the very bottom of Indiana. They are a visual treat both spring and fall. Amazing! truly beautiful - I could explore what you have done for hours, and still find new things. Thank you, Ann for your comment and for your first time visit! Magnificent Pam, absolutely magnificent in all respects, and well worth the wait! What a wonderful story, nicely told and perfectly illustrated. This helped tremendously as it is starting to all come together for me: how to freely use my graphic design experience and melt together journaling & writing with gardening with hiking with drawing with watercolor with...joy! Thanks! Sandy, thank you so!! Blush! 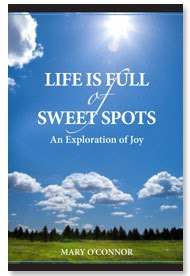 You are an inspiration with your journals full of interesting stories and beautiful sketches. I am new at this fun journey of creating sketching journals and it's great to share these journals with other sketchers. Pam, I absolutely loved this post. I think the name "sparkleberry" sucked me right in from the beginning, and then the art, so beautiful, took over--- and as always, your lettering is extraordinary. I've never thought about trying something out with tissue paper. What a great idea...thanks for posting. ...also...thanks for all the history. I love this sort of thing! Hi Kelly.... yes 'Sparkleberry' is contagious! Happy to introduce overlay paper to you and the history :) Thanks for your kind words! Love this sketch, it's so happy and your lettering and movement very whimsical. Thanks for sharing all the interesting knowledge you have, very cool. Thanks so for your comment, Lisa!